The first skitarii ready for service. 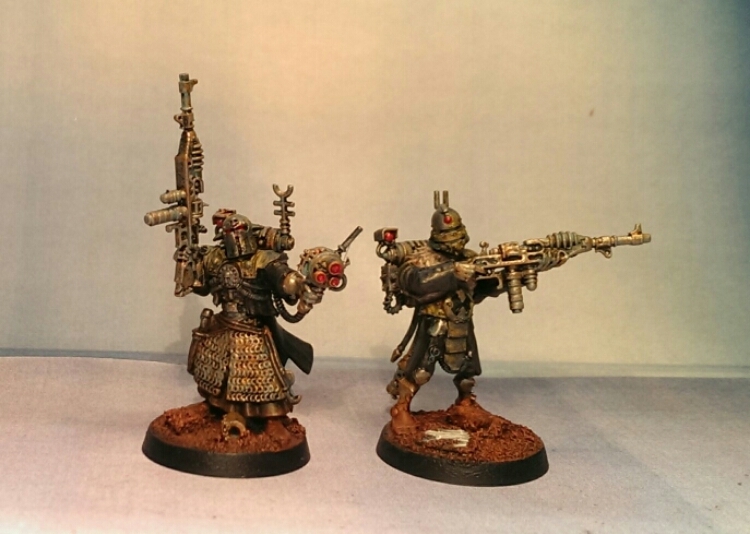 Like their loyalist counterparts the Skitarii of the Cult of the Red Crown are relentless in their pursuit of an enemy of the Cult.. These two where really fun to paint and it went surprisingly fast! That’s reassuring cause I want a lot more of them. That is a great colour scheme you’ve got there. The dirty metals are brilliant. I always say a paint job that leaves you wanting to paint more is a good un. Get cracking on the next batch while the iron is hot. Cheers mate 🙂 it’s a difficult balance striking the grimy vs actually seeing details. I think I’ve struck it pretty good though the yellow ended a bit dirtier than I planned.